I never got to try Chef Joseph Mahon's burger while he was at Bastide, but everyone raved about it. 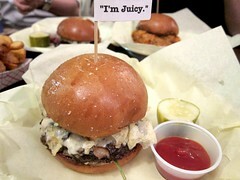 Naturally when he opened Burger Parlor in Fullerton, I decided I had to try it, OC or not (being in Pasadena, OC seems extra far). 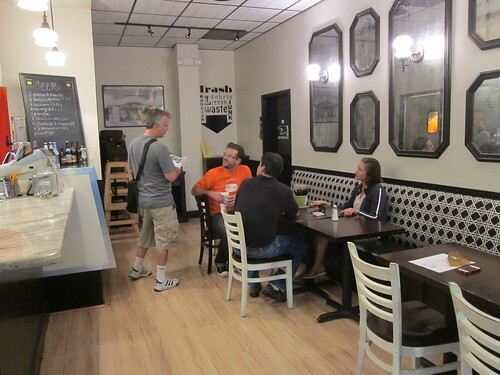 Burger Parlor is sort of a permanent pop-up. 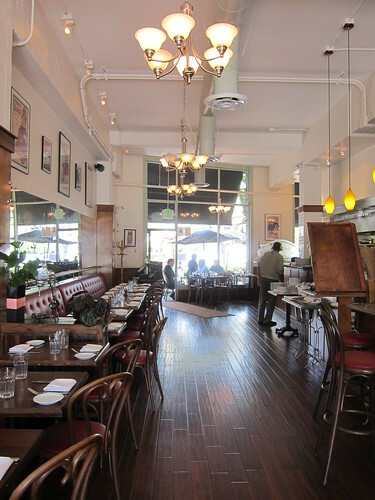 The space is Rialto Cafe by day and Burger Parlor by night (Wed to Sat nights only at the moment). In this casual and intimate space, regular customers can chat unintimidated with Mahon, and occasionally his wife and adorable baby boy. There are nine burgers on the menu and thick cut steak fries, but a sign indicates that he can also construct something vegetarian-friendly. You need only ask. Mahon has the burger basics down: good meat patty, ground daily from Nebraska Angus beef, and good buttery buns. Of course, he doesn't just stop there - more after the jump. Who doesn't like pupu? No one, because who doesn't like Hawaii? In conjunction with the Hawaii Visitors Bureau, Los Angeles Magazine threw an island-style cook-off between four of LA's greatest chefs. A pupu cook-off. Readers tried the pupu and voted online over a period of few weeks, and it all culminated in a cook-off between two finalists at the Fairmont Miramar Hotel and Bungalows. The attendees don't want to just come and watch the cook-off, of course. 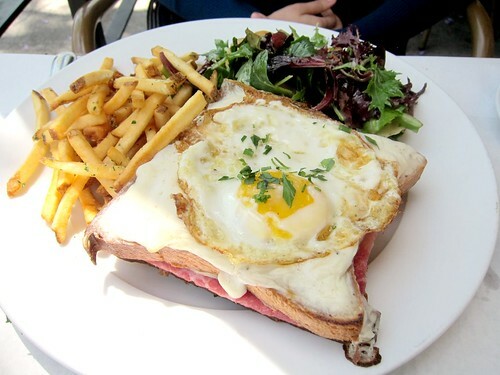 We want to eat and drink and have fun. And those we did. 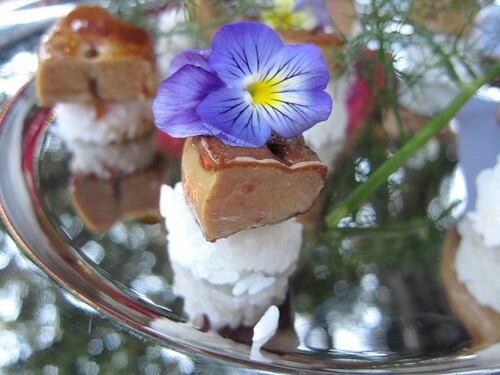 We also ate the pupu prepared by the two finalists: Chef Mark Gold from Eva Restaurant prepared sushi with whole lobes of foie gras, tea smoked plum, and grated yuzu. Chef Neal Fraser from BLD prepared Hawaiian tuna poke with wasabi tobiko and sambal creme fraiche; he also prepared some spam banh mi. If you hadn't noticed, there are quite a few women in the beer world in the area. Women brewers, beer writers, beer bar managers, etc, and they want to get more women out there to learn more and fall in love with beer. To that end, some of them decided to hold a girls' only beer 101 tasting class at Tony's Darts Away in Burbank, which houses over 30 California craft beers. 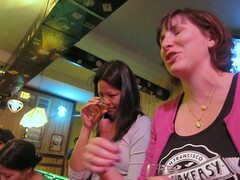 The beer tasting was led by Paige from Tony's Darts Away and Ting from Eagle Rock Brewery. For those of you who are interested, Ting actually holds girls' only beer classes at the brewery on the third Wednesday of every month. 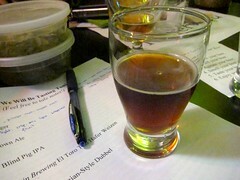 Before the tasting, we had to first learn about the four major ingredients: water, hops, barley, and yeast. Malt/malted barley gives color and body to the beer. Pilsner malt is the base malt (used in lagers) and determines the gravity (how much alcohol and sugar) of the beer. 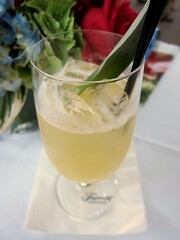 In addition, crystal malts are added. Named by numbers (like C-120), the higher number indicates a darker roast, which also gives more fruit characteristics. Hops give bitterness to the beer (which comes from the alpha acids) and without them, the beer would be overwhelmingly sweet and have no balance. 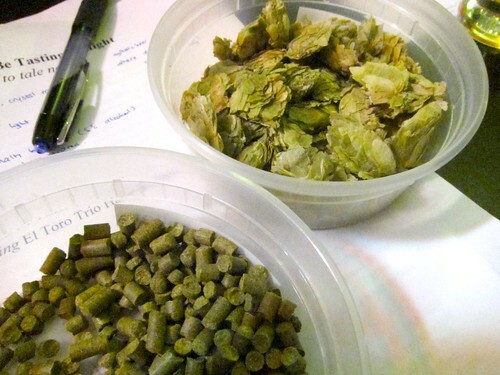 They showed us what the original dried hops look like (right) before they're packed into the pellets used today (left). The pellets save space and also make it easier to obtain consistent flavors. 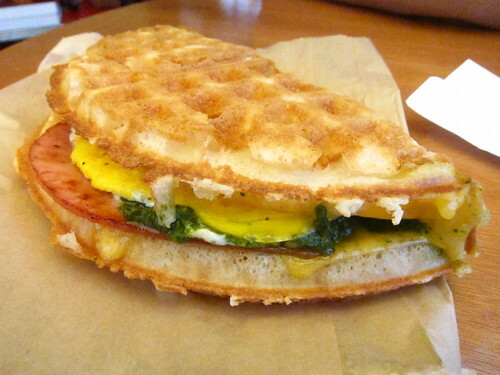 Waffle sandwiches may be one of the few things that would make me venture out to Orange County. That's why when I had an invitation to the avocado cooking demo in Anaheim, I decided to make a day out of it and visit one OC place that's been on my list: Bruxie Waffles. Most of my fellow bloggers love this place, although one warned me that some of the sandwiches weren't all that. Still, I wasn't deterred and made my drive on a hot summer day. My only problem when I got there was figuring out which one to order. Luckily, when I checked in on foursquare, I saw a tip from a fellow blogger, inomthings, saying to get the Green Eggs and Ham. Well, green eggs and ham it is! It was California Avocado Week in Downtown Disney Anaheim 3 weeks ago, and the chefs from each restaurant held an avocado cooking demo and sampling. 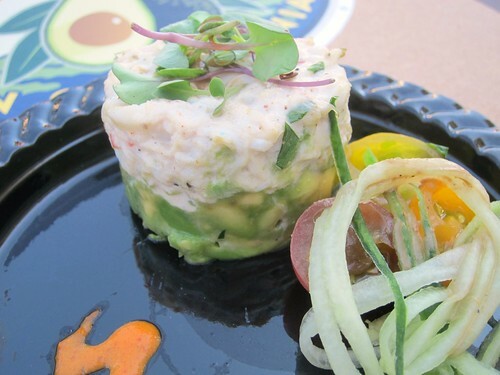 I attended one where Chef Darrin Finkel from Jazz Kitchen cooked up a New Orleans-inspired crab ravigote and california avocado napoleon and here's the recipe for you to try at home. Remember the California avocado season only lasts until the fall, so hurry to enjoy it! Dice avocado into small pieces. Squeeze lime juice on avocado, season with salt and pepper. Using a ring mold, press diced avocado on the bottom of ring mold. Gently toss crab meat with the chipotle ravigote sauce, season with salt and pepper. Spoon crab directly on top of avocado and press down gently until they are molded together. 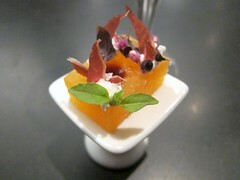 Remove ring mold and garnish dish with heirloom tomato salad. 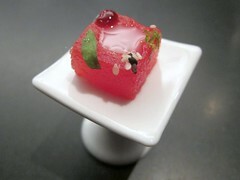 For additional garnish, squeeze 3 dots of pepper coulis around avocado crab mold. Top with micro greens. Cupcakes are old news and cookies are ubiquitous. It's time for delicately crafted mini tarts with creative flavors. Welcome Früute in West Hollywood. 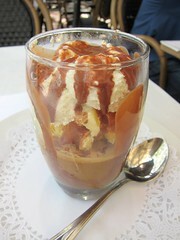 Früute is a collaboration of two sisters and their mother. 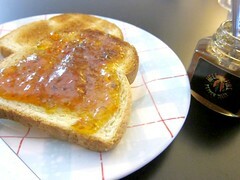 The mother develops the recipes for the tarts, the daughter (at least one of them) brings her experience in branding. 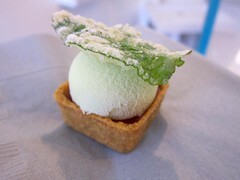 It's a tiny shop on Santa Monica Blvd serving gorgeous tiny tarts like this Wasabi with blood orange center, frangipane in pistachio crust, garnished with mint leaf tempura. 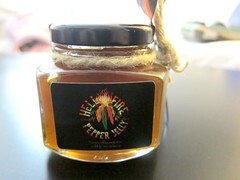 There are more than a dozen flavors now, which you can check out on their website (the photos there are beautiful). The mini tarts go for $3 each, which I initially considered expensive for the size, but considering that a cup-sized cake dough and a piece of cookie these days go for $3, these meticulously crafted tarts are of better value. The Gay and Lesbian Alliance Against Defamation (GLAAD) is celebrating their 14th year with a Top Chef extravaganza this Sunday, July 24. The event, GLAAD Hancock Park, is sponsored by Bravo and ROKK and features a Bravo Top Chef Challenge with Top Chef stars Fabio Viviani and Antonia Lofaso, hosted by Top Chef: Masters alum Susan Feniger with celebrity judges and special guests including: Dustin Lance Black (Milk, 8: The Mormon Proposition), Jamie Lauren (Top Chef), Shonda Rimes (Grey's Anatomy) and Jessica Collins. There will be tasting stations from LA restaurants including Border Grill, Comme Ca, Dominick's, Firenze Osteria, Little Next Door, Michael's Restaurant/Calivirgin, Paul's Kitchen, Ray's and Stark Bar, and Simon L.A., and a food and wine-themed auction. Tickets to this event are $100 for general admission and $150 for VIP, but YOU and a guest can go for free! 2. To gain extra entry, tweet the following: "I want to win VIP tickets to #glaadtopchef! Pick me, @gourmetpigs and @glaad! http://bit.ly/pUMwJG"
3. Get another extra entry by posting a link to this giveaway on Facebook. Make sure you tag my Facebook page, Gourmet Pigs so I will know you posted it! You have until midnight this Thursday, July 21 (end of the night). I will then draw a random winner. If you don't respond to the email by Friday morning, I will draw another winner. I will need to give GLAAD the name of the winner Friday morning, so do check your email! 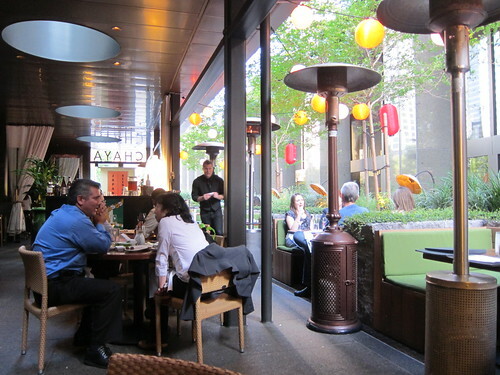 For the summer months, The Chaya in downtown has something special for you: an outdoor summer beer garden, complete with a robata grill, izakaya-style dishes, and of course, beer. Paper lanterns for that Japanese festival feel. One of our favorites was the Soy Braised Short Rib Sukiyaki Style ($9). 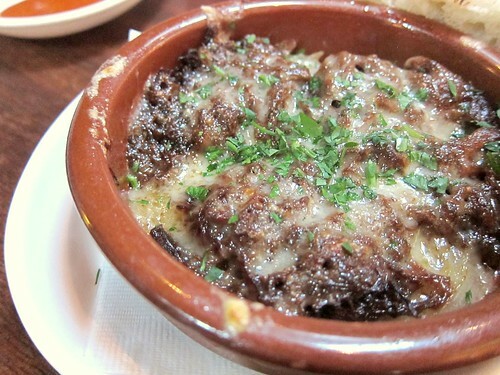 What came was not what we expected, but it was a delicious bowl of shredded braised short rib topped with melted cheese, served with toasted bread. The short rib was so tender and melts in your mouth. Until July 19, "Swill Automatic Becomes Bar Mitzvah" is happening at this new downtown wine bar, serving a 5-course modern Israeli cuisine paired with Israeli wines ($45 pp, $66 with wine pairing). I was invited to try the Israeli dinner on their soft opening night and since I have never really had Israeli food or wine, I was curious. I had the preconception that it would be a Jewish dinner, but the menu leans towards Mediterranean. It turns out that Israeli cuisine has adopted many Middle Eastern and Mediterranean influences. The service that night was spotty since it was the first time they served a 5 course meal (the wine usually serves small plates). They were pleasant and friendly, but the courses and wines didn't come out as planned. Hopefully it would be much better the rest of the week. Nonetheless, I tried many new things that night and learned quite a bit about Israeli food and wines. BREADBAR and Chef Noriyuki Sugie of Ironnori brings back ramen to BREADBAR's 3rd Street location. 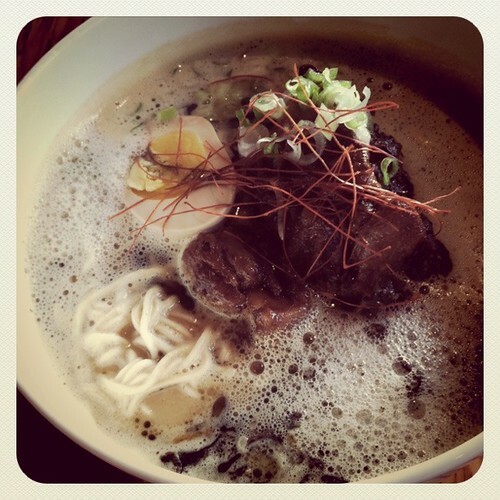 Not the pork-based tonkotsu ramen, but beef ramen, dubbed Ramen Bull. The menu is simple but diverse (as far as beef go). There's the oxtail, beef tongue, spicy ground beef, even a vegetarian ramen. I was recently invited to taste chef Nori's ramen creations. I had gotten there early and my +1 was running late, so I ordered a plate of Corned Beef ($6) to munch on. 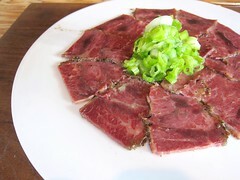 The slices of corned beef was topped with charcoal oil, adding to the flavor. Texture-wise, I prefer the tender beef tongue that comes next. 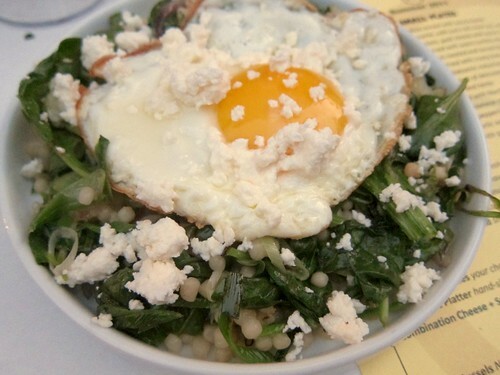 Now that the menu for LA Street Food Fest is up, you can start planning your visit! There are plenty to look forward to, and I found even more at a recent media preview event held at Iota Coffee in Koreatown (opening soon). Okonimiyaki from Glowfish Truck filled with bacon and cheese. 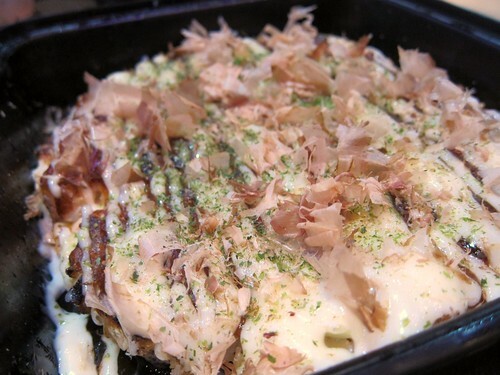 The last time I had okonomiyaki was at Gaja in Lomita, so I'm glad to find out there will soon be an option (hopefully) closer! The Glowfish Truck, specializing in "Japanese Festival cuisine" is making their debut at the Food Fest. 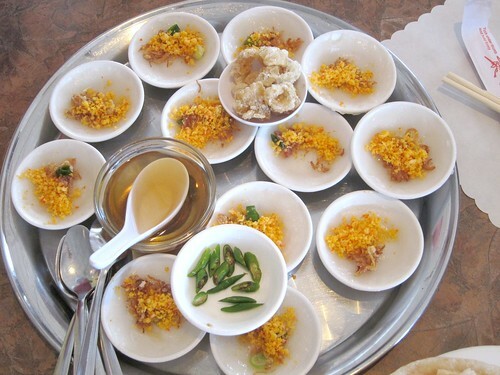 Not too long ago I blogged about the northern Vietnamese food during a Little Saigon North to South tour with Wandering Chopsticks. This was our second food stop, Central Vietnamese cuisine at Quan Vy Da (well, she said it was more South Central). 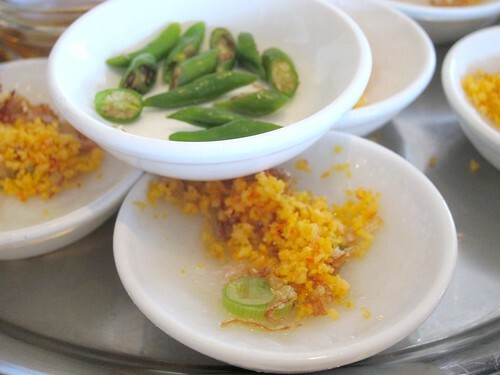 I had been looking forward to this stop all day, because they have banh beo and banh it ram. I'm biased and I declare central my favorite food region of Vietnam, because I love chewy rice cakes! 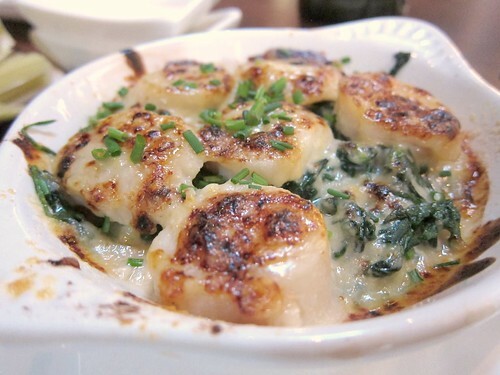 While it may seem a simple dish, it's easy to screw it up by having the rice cake too thick or too dense. The ones at Quan Vy Da were just right for me. You can top it off with pork rinds if you want extra flavor and crunch (and yes, you do). 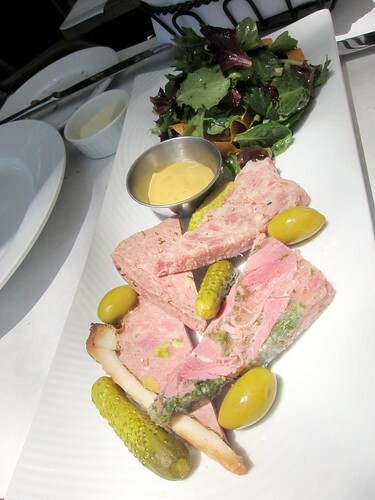 The Capital Grille in Beverly Hills recently launched a happy hour, with $6 drinks and bar food every weekday from 4:30-7pm. To spread the word, they offered to host a happy hour for my friends and readers with complimentary food and happy hour-priced drinks! There's a bar next to the main restaurant downstairs, but you can drink while getting fresh air at the Terrace upstairs. The happy hour food turns out to be a really great deal! 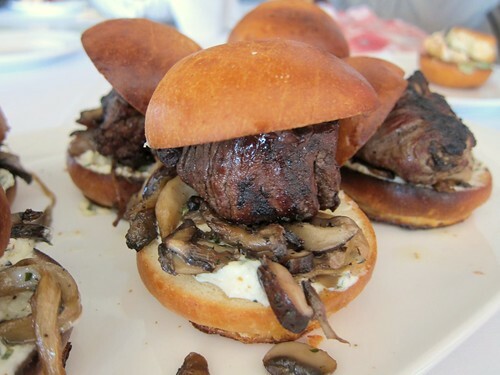 For $6 you will get two mini tenderloin sandwiches, each with a thick, juicy piece of tenderloin steak and sauteed mushrooms. Who needs burgers when you can have steak? 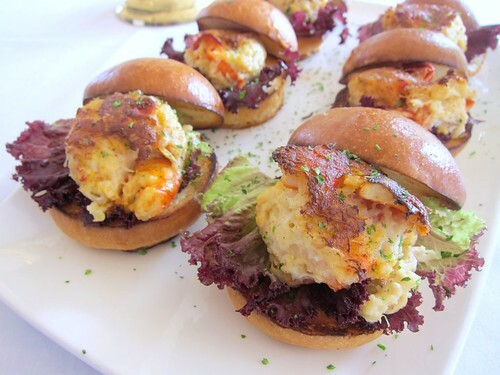 Or, two lobster and crab cake burgers. That's $3 each for a lobster-and-crab-cake burgers! Last time I had crab cake I paid $13 for one. These were not one of those crab cakes that are mostly flour, these are filled with crab and lobster. July Food Events. Go Wild! There are A LOT of food events going on in July. Are you ready? This annual event is the marriage between Mexican food in LA and Latino-owned wineries in California. Set in the beautiful courtyard of downtown's Union Station, the event benefits AltaMed, which provides quality healthcare to underserved communities. 6pm, Union Station. Admission: $200. July 16 and 17 may be Carmageddon, but with events in every neighborhood, you can still party it up while avoiding the freeway! For the eastsiders, head to the Rose Bowl for the 2nd Annual LA Street Food Fest Summer Tasting Event. This year they're splitting it into three events with different themes, to minimize crowd, but each event will feature the same great line up of LA's street food and restaurants, and some guest chefs from Mexico! Each event will feature Ice Cream Social, tequila, gin, beer, and all that good stuff. The evening event is 21+ only. If you're in Hollywood, head to the Extravaganza for the Senses. This annual event benefits the Saban Free Clinic and features over 40 restaurants including Chaya, Public Kitchen and Bar, Oliverio, and more. There will be silent auction going on too, if you feel like "shopping." 6pm (VIP), 7-10pm (general). Sunset Gower Studios, Hollywood. Admission: $225 VIP, $100 general. Westsiders, fear not, you can also avoid the 405 closure at Eat Real Fest. This festival features all manners of food things that are local and sustainable. Street food vendors, marketplace, local small-batch brews, hands-on workshop for making bitters and sauerkraut, jamming and pickling contests, demos. Entrance is free and you pay as you go, so there should be no reason not to drop by. Saturday 10:30am-9pm, Sunday 10:30am-5pm. 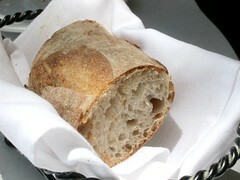 Helms Bakery, Culver City. Admission: FREE. Join Angeleno Magazine as they announce and honor the best in Los Angeles dining, partake in food created by LA's best chefs and restaurants including Ray Garcia (FIG), Roy Choi (A-Frame), David Feau (The Royce), and many more. Yep, Galco's first ever soda tasting is coming to benefit The Southwest Museum. There will be soda pops (obviously), "poptails", live music and auction. 5 course menu featuring fresh, seasonal produce from local farms, with "perfectly paired" wines. Call (626) 585-6218 for reservations. This stylish event benefits St. Vincent's Meals on Wheels, which helps feed seniors around the city. 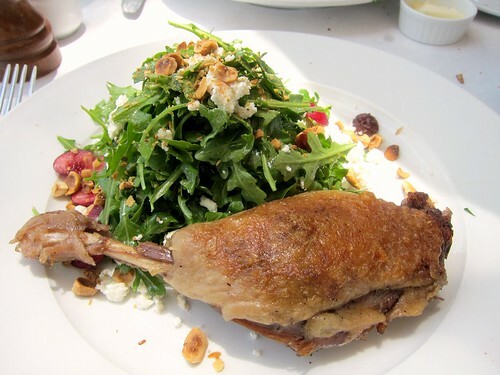 Ten great LA chefs including Celestino Drago (Drago, Drago Centro), Mark Gold (Eva), Tim Guiltinan (The Raymond), and Sherry Yard (Spago) will prepare your meals, while you eat them on the sands of Santa Monica beach. There will be cocktails crafted by the 1886 Bar at The Raymond (my favorite bar in Pasadena), and they promise oysters on the half shell all night long. Brü Haus has opened its doors right next to Cabo Cantina with around twenty draft beers and about the same number in bottles. 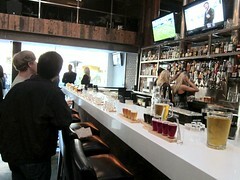 Brü Haus is possibly Brentwood's first gastropub; at least I can't think of another. 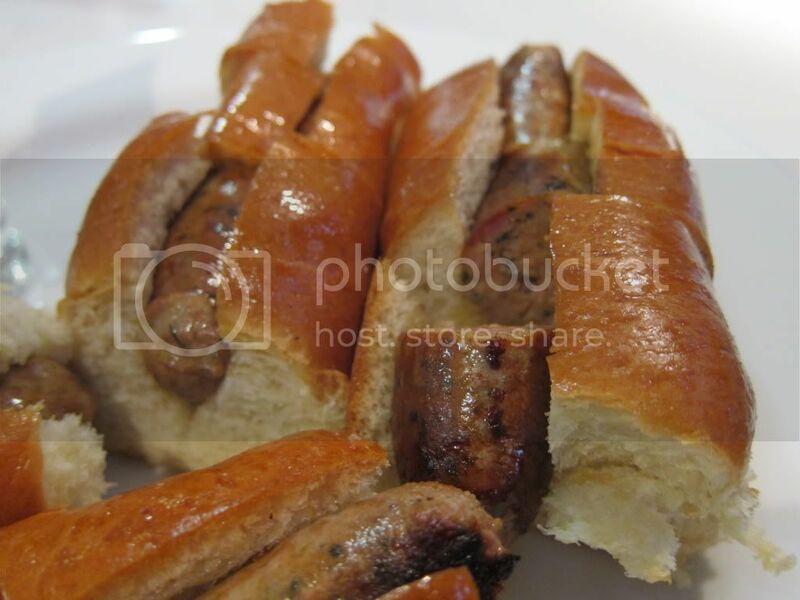 The main fare at Brü Haus is the sausages with interesting selections (including a Berliner currywurst) and vegan options, burgers, and pretzels. They have about 20 beers on tap and an equal number in bottles. Make sure you get some of their housemade sauces (sambal aioli, jalapeno ranch) to go with either your sausages, burger, or fries (or sweet potato tater tots). My favorite was the bright pink beetchup. 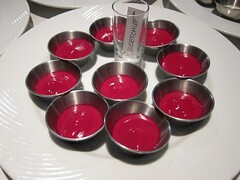 Yes, that's beet ketchup. Sounds weird but I was hooked. Ten cocktails, paired small bites, and over 2 hours of watching The Aviary bartenders and chefs in action inside the kitchen - or as they call it, the cage. 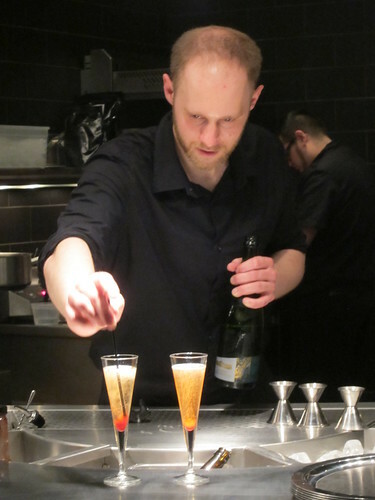 That's the Kitchen Table experience at Grant Achatz's new bar, The Aviary. 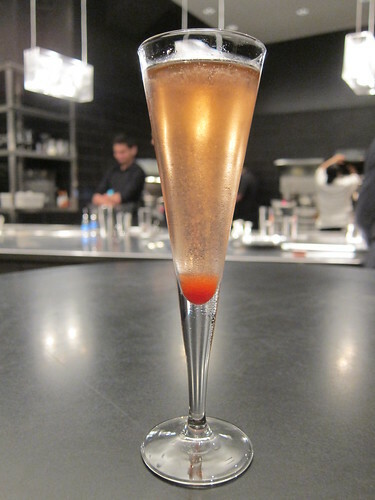 Since I wasn't able to snag a reservation at Next Restaurant on my last Chicago visit, I opted for the Aviary's $165 10-course cocktail tasting at the Kitchen Table. 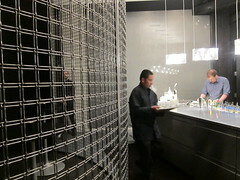 While the main lounge area featured plush booths and dim lighting, the kitchen table (inside what's dubbed "the cage") is a tall metal table and two stools facing the minimalist kitchen and "bar" (with perfect lighting for photographs, I may add). Even though this was a cocktail tasting, they still wanted to start off with a sparkling wine, so Course #1 was an Alsace sparkling wine with strawberry puree, which was paired with Compressed watermelon with soju, topped with sesame seed. I had begged my companion to come here with me even though he can't drink much alcohol. I'll drink his share, I said. But when they saw he wasn't finishing his first cocktail, he told them he doesn't really drink, and Aviary decided to do a non-alcoholic version of the tasting for him. In some cases, that just meant water instead of liquor. In others, it was an entirely different drink (that still pairs with the bite). 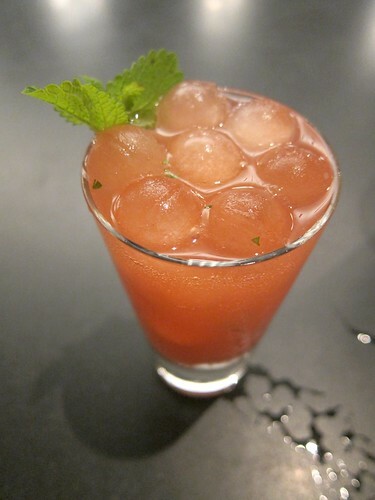 Instead of adding a dash of bitters, those ice spheres you see contain Peychaud bitters which release flavors as the ice melts instead of diluting. This was paired with Cantaloupe compressed in champagne and topped with prosciutto, an elevated version of the typical prosciutto and melon.